In 2001, theFashionSpot established itself as the first-ever online community of designers, stylists, and industry influencers. Now the web’s largest, this vibrant social forum is known for intelligent, honest and uncompromising discussions on all aspects of the fashion industry. With this legacy as our beacon, theFashionSpot has grown into an editorial destination delivering original, premium content that speaks to the passionate, engaged community at the heart of the site, and inspires a growing audience of trend influencers. TheFashionSpot provides in-depth coverage of fashion, beauty, lifestyle, and celebrity trends for an audience of 4.3 million* every month. Our seasoned editors and experts explore the industry’s most compelling and controversial issues (such as model diversity on the runway and the role of sustainability in fashion) alongside regular features like trend forecasting, shopping roundups, beauty tutorials, red carpet style, and features on health, relationships, and career. Compelling interviews with luminaries like Jason Wu, Eric Daman, and Michelle Phan give readers insight into emerging and well-known industry figures and celebrities. Monthly guest editors add a unique perspective from such notables as Tim Gunn, Josie Maran, Trish McEvoy, Katie Cassidy and more. With extensive coverage of New York, London, Milan and Paris Fashion Weeks, tFS offers a first look at the season’s collections and trends including insightful reviews, full collection slideshows, backstage beauty, and street style. On tFS TV, our original series, theFashionDish, brings together fashion industry leaders like June Ambrose and Robert Verdi for a unique panel discussion about Fashion Week’s top collections and most exciting emerging designers. In celebration of the fashion industry, we launched the annual tFS Style Awards in 2013. Nominated by our fashion-addicted forum members and voted on by our readers, the Tiffies recognizes exceptional contributions in fashion design, advertising, modeling, editorial, and entertainment. TheFashionSpot is a property of TotallyHer Media, LLC, an Evolve Media, LLC company. 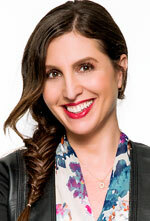 Jennifer Davidson is the Editor-in-Chief of theFashionSpot and Co-founder of StyleBakery.com. Prior to joining tFS, Jennifer produced fashion segments for television and was a fashion stylist for television and red carpet events. Counting Diane von Furstenberg and Ali MacGraw circa 1970 as her style icons, Jennifer has a profound weakness for printed dresses and vintage Chanel jewelry.